Leaders throughout the state can improve operations and plan effectively for the future with the help of practical, customized assistance that we provide. This assistance takes a variety of forms, from economic development to human resources management and planning and environmental services. Governments seeking assistance with their economic development activities turn to us for specialized services such as research, technical assistance and training. We can help provide the building blocks for your community’s overall economic development efforts. We analyze cost allocation and create fiscal impact studies to analyze the fiscal and economic impact on your government. Every government organization needs a plan to guide its use of resources including employee time and use of funds. We help governments develop their strategic plans and identify the implementation steps necessary to achieve their goals. Government and community leaders planning for growth and addressing challenging environmental issues can make better informed decisions and craft innovative solutions with our help. Faculty expertise includes land use planning, downtown revitalization, environmental management and corridor planning and design. Whether a government wants to ensure that its employees are being paid in line with current standards, carry out an executive search or establish up-to-date promotional testing, our human resources management faculty are ready to offer expertise and experience that can help. We provide timely support for policy research and technical assistance activities for state and local governments as well as for other university programs. Our evaluation experts are skilled at assessing the effectiveness of different endeavors, from individual programs to interdepartmental or even system wide efforts. We provide Georgia leaders at all levels of government with regularly updated and consistent population data. This data is needed for informing their policy decisions, which range from aging to zoning. State and local government leaders come to us for reliable, objective information, customized assistance and government expertise that provide insights into the issues they face. State and local government leaders can benefit from insights and information that might otherwise be unavailable if not for our customized, comprehensive studies on such issues as annexation, tax and expenditure, financials and local government consolidation. Promoting excellence in government means helping governments and community leaders lay a foundation for economic growth and job creation. Our workforce development services range from customized technical assistance to training and professional development. Each year, thousands of elected and appointed government officials and administrators enroll in continuing education opportunities offered by the Institute of Government. These officials and administrators take part in over 600 training and education courses that improve their knowledge and skills. Participants benefit from the advanced instructional tools and broad expertise that our instructors bring to all of their education and professional development programs. State agencies and local governments can create a leadership training curriculum customized to their needs. They can choose from an array of leadership classes designed and taught by our faculty. We offer economic development professionals, development authority and downtown development authority board members, chambers of commerce, and government officials across Georgia an opportunity to participate in training courses that focus on subjects critical to economic development. Promoting excellence in government means helping governments and community leaders lay a foundation for economic growth and job creation. We provide training and professional development as part of our workforce development services. We offer a variety of financial training programs for city, county, state, and school system finance and office personnel. Trainings can improve their financial management skills or help them to earn certification. Human Resources professionals can benefit from our training programs that are offered in partnership with GLGPA. We also offer online training opportunities in addition to a 360-degree assessment and executive coaching. Board of education members can enhance their leadership skills and knowledge of school governance through a six-module training program. The program fulfills the annual training requirements set by the Georgia Department of Education. Our online training courses combine the quality training associated with the Institute of Government with the flexibility to meet the needs of busy government employees and elected officials. These courses allow students to progress through their chosen courses at their own pace and on their own schedules without the travel time and related travel expenses commonly accompanying traditional classroom training courses. We offer a variety of special workshops that are customized to your specific needs for different levels of employees in both state and local governments. Think of special topic workshops as made-to-order training opportunities that can be mixed and matched from our comprehensive menu of courses to fit your needs. Choose only the courses you need so your limited resources have the maximum impact. Planning retreats and customized facilitations offer time in a relaxed, informal atmosphere away from distractions to discuss issues and set goals and priorities. This will better meet current and future organization and community needs. We offer a variety of training courses to help government professionals become certified in their respective fields. Appointed Board Members may be required to complete training as part of their role. Our training focuses on what you need to know to best complete your duties as a Board Member while helping to fulfill mandated training requirements. Instruction provided to the Georgia General Assembly in the form of training and advanced skill development helps members navigate the world of public service. We work with associations to offer conferencing and training services. State and local governments can make more informed decisions and achieve greater efficiency in their operations with the help of geographic information systems (GIS). We are a leader in GIS innovation in Georgia and nationwide while also providing custom application development and data analysis and visualization. Turn to us for digital map production, local government GIS services and more. With our experience in the latest cartographic and data management techniques, we are Georgia's leader in GIS technology. Our specialists help government entities realize the benefits of GIS technology and smoothly integrate it into their operations. We design and develop custom solutions to help your organization meet its goals for web enabled software. We offer web development services to cover your needs. We provide services to assist you in discovering more from your data to make it more actionable. We can work with you to build custom ETL (Extract-Transform-Load) scripts and design databases so that data can be used for reporting or visualization. We have leveraged a self-service data analytics and visualization platform to put the power of data discovery and insight in your hands. We can work with you to extract your data from its source system. We can then load it into our analytics platform, providing you with greater flexibility for interacting with your data. The International Center's instructional programs, technical assistance and research initiatives are grounded in the Institute of Government's more than 90 years of experience working with public officials to improve governance and people's lives. The International Center works to help nations in transition strengthen municipal and administrative capability and brings scholars and practitioners to Georgia to help officials understand and respond to global trends affecting the state. Governments throughout the world seek out our International Center. The International Center provides technical assistance and comprehensive training and development programs for government officials and personnel. Governments around the world turn to our International Center for assistance and applied research in a number of critical areas, from economic development to human resource management. The same Carl Vinson Institute of Government and University of Georgia specialists who serve state and local governments in Georgia provide their expertise to help answer tough questions and tackle daunting challenges abroad. Participants in the International Center's training programs benefit from a unique combination of classroom and experiential learning to help them improve their knowledge and skills. Practitioners on the ground and recognized subject matter experts provide a rich assortment of professional development opportunities designed to help public officials from all levels improve as effective administrators. International and American students and scholars can engage in a variety of enriching opportunities through the International Center. Faculty actively involve them in the International Center's work with governments around the world. The participation of students and scholars helps develop a new generation of leaders with a global outlook and cultural insights. Students interested in state and local government can gain valuable experience and prepare for careers in public service through a variety of undergraduate and graduate experiential learning opportunities that we offer each semester. The Vinson Institute Fellows Program is an educational opportunity for UGA's undergraduate students interested in state and local government. Through the program, students will have an opportunity to become involved in our training, applied research and technical assistance programs and other projects for state and local governments in Georgia and internationally. Students from Georgia's public and private universities and colleges gain firsthand experience in the lawmaking process through the Georgia Legislative Internship Program, coordinated by the Georgia General Assembly. Beyond just getting a paycheck to help contribute to living expenses or tuition, students can gain valuable experience through a part-time job. We regularly offer part-time paid employment opportunities for UGA students. The goal of the Public Service and Outreach (PSO) Graduate Assistantship Program is to grow the number of graduate assistantships in the PSO units while giving UGA graduate students more opportunities to participate in research and public service and outreach endeavors. Since 1927, the Institute of Government has worked with public officials throughout Georgia and around the world to improve governance and people's lives. Since 1927, the Carl Vinson Institute of Government has been an integral part of the University of Georgia. A public service and outreach unit of the university, the Institute of Government is the largest and most comprehensive university-based organization serving governments in the United States. The Carl Vinson Institute of Government has served state and local governments for 90 years. We celebrated our 90th Anniversary year in 2017 and are proud to share testimonials from our clients, stakeholders and friends. Welcome to the Carl Vinson Institute of Government’s website. Read a special message from Institute of Government Director Laura Meadows. Learn more about how the Institute of Government serves Georgia's state and local government needs. Meet our faculty and staff. Learn more about our team and their areas of expertise. View bios and find contact information. Got questions? We've got answers! Some of our most frequently asked questions are provided to assist you. You may find what you're looking for right here. The Institute of Government employs more than 150 faculty and staff who assist public officials in serving citizens in Georgia and throughout the world. Our team has a passion for public service and we are committed to promoting excellence in government. Read our latest Annual Report to see all the work we have accomplished in the past year. Built in 1882 and located on North Milledge Avenue, this unusual octagonal building has an exquisite Victorian interior. The fully restored chapel is perfect for a variety of university and community groups for plays, concerts, lectures, weddings, meetings and other special events. The theater and Green Room (conference area) are both available to rent. 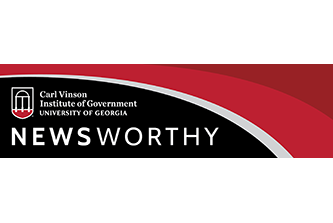 The latest edition of Newsworthy, our quarterly electronic newsletter, is loaded with informative articles about Institute of Government collaborations that enhance career readiness and governance in communities across Georgia. Mayor John Gayle and the Valdosta City Council held their annual Strategic Initiatives Summit (SIS) on March 15 and 16 at the Woman's Building in Valdosta. The Harold F. Holtz Municipal Training Institute presented a Certificate of Excellence to Lilburn council member Tim Dunn.